Howdy Fellow Gamers, Michael here. Today’s Game of Choice: Puzzle & Dragons! A phenomenal game by GungHo. This game has kept me coming back daily for almost 2 years now, and I don’t foresee quitting any day soon. In this post, I’m going to go over some of the basics of the game to highlight its features. Let’s dive in! Image of Puzzle & Dragons is courtesy of GungHo – On Android. The goal of this game is, to put it simply: Match Colored Orbs to attack and defeat monsters. That may sound incredibly simple, but it’s by far the most satisfying thing to get 10+ combos and do millions of damage! Now, in the above image is your central HUB. This is where you select which mode of dungeon you wish to partake in. Normal Dungeons: Your Main Story. Technical Dungeons: Similar to Normal, just slightly more difficult and the enemies can use skills against you! 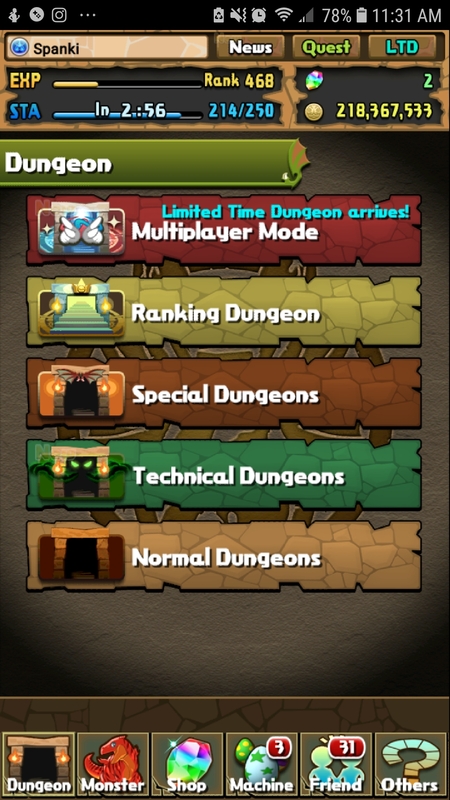 Special Dungeons: This is where Event/Daily/Weekly/Monthly/Collab Dungeons are held, great rewards await you! Ranking Dungeons: Whenever GungHo holds a tournament, this is where you can go to participate. Generally, you have a fixed team, and only have 5 minutes to clear it to get the best score possible! Talk about pressure! Multiplayer Mode: Here is where you can play with friends, or pair up with random players to tackle incredibly powerful monsters! Next up is the Egg Machines. These can be your best friend or your worst nightmare. Let’s find out why! Pal Egg Machine: To use this machine you need 500 Pal Points per use, which may seem like a lot but it’s not. You get points by using other players monsters in a dungeon, logging in daily and events held by GungHo. Rare Egg Machine… This one costs 5 Magic stones per use, which you can get by clearing Dungeons, Rewards from certain quests and in-app purchases. From time to time, this machine changes to a Godfest Exclusive Machine. Which gives you a chance of getting some of the most powerful monsters in the game! The last one is the Collab Machine, these are limited time machines. 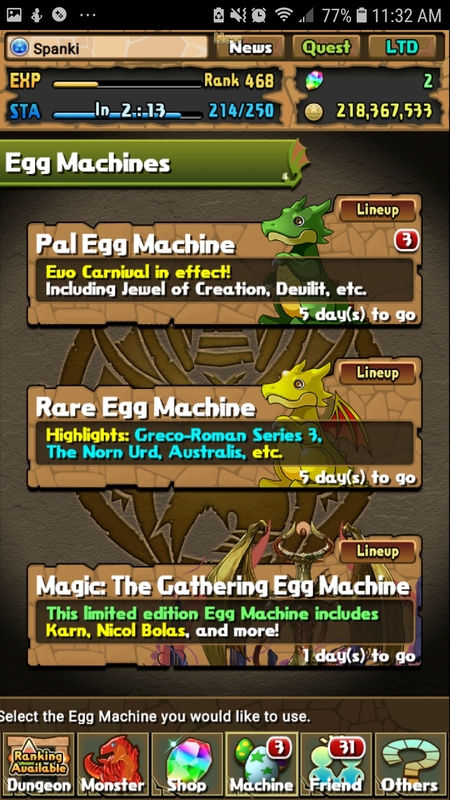 They cost the same as the rare egg machine but you have a chance to get limited unique, powerful monsters! In this section, we’ll discuss how you can get more powerful. Power-Up Fusion: Here you can fuse monsters together, decrease the activation time for your monster’s skills, add pluses to your monsters and unlock awaken skills to make them even more powerful! 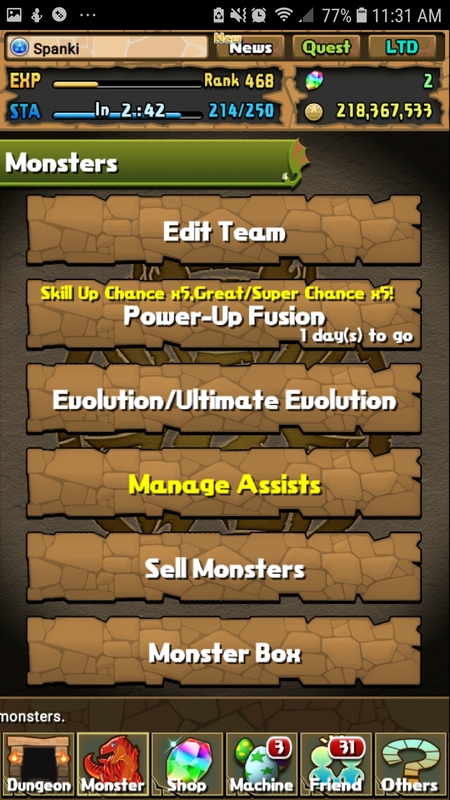 Evolution/Ultimate Evolution: Pretty much what it says, here you can evolve your monsters to get different skills and increase their base stats. Manage Assists: With the assist feature, you can essentially “Marry” monsters together. Once married you can use both monsters skills in battle, and if they’re the same color your base monster will get a stat boost! In conclusion, Puzzle and Dragons is a game that has simple mechanics, but there is so much to do that you won’t even notice it. I hope this was helpful. if you have any questions or thoughts, post a comment below! This game is available for both Android and iOS. You can download it from the Play Store(ESRB 10+) & App Store(ESRB 4+). Have a great day gamers, GL;HF!